I was looking through my stats and noticed that it’s been a while. I thought I should report so you won’t think I’m dead. I think I’m good for another twenty. I have been working away on the quilt. My machine is tired and in need of a tune up, but my other one does not have the applique stitch I am using. I am down to the last two blocks. When they are finished, my baby is going to Westminster for a much needed spa day. My other machine is better for the final quilting anyway. I’m getting excited to be so close to finishing. Besides, I’ve got an enormous pile of sewing that needs to be done. Speaking of leftovers…… Who said that? I made turkey potpie. Only, I don’t make a pie crust. I make biscuits. Unbeleivebly good! So easy. 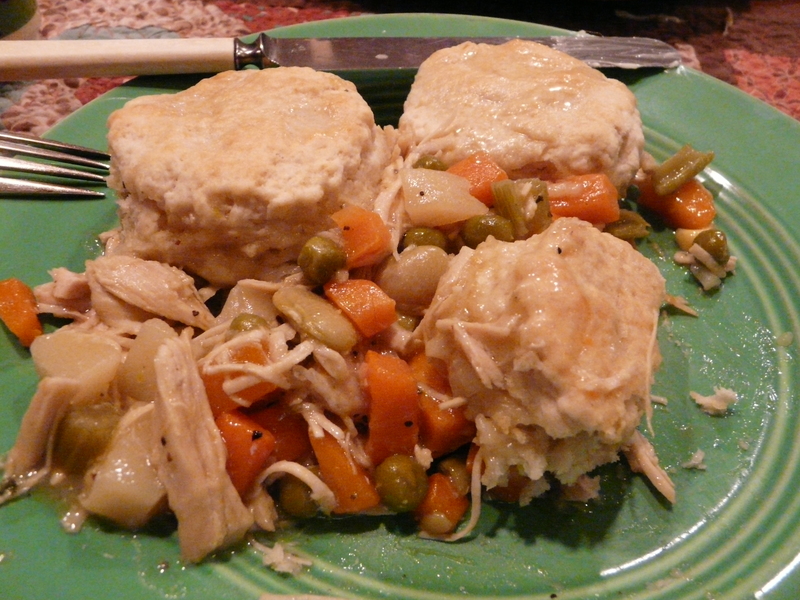 Leftover turkey, gravy and vegetables. If you don’t have enough vegies left, canned mixed vegetables work well. Make the biscuits with just enough milk to hold them together. Oh. You don’t make biscuits? Well, you should. I’ve never tried the ones in cans. You will notice that I use an old Corning ware pan. I put the turkey, vegetables and gravy in the pot on a medium setting. Stir it up good. Sometimes I have to add a little water or a little flour. It should be a little thick. 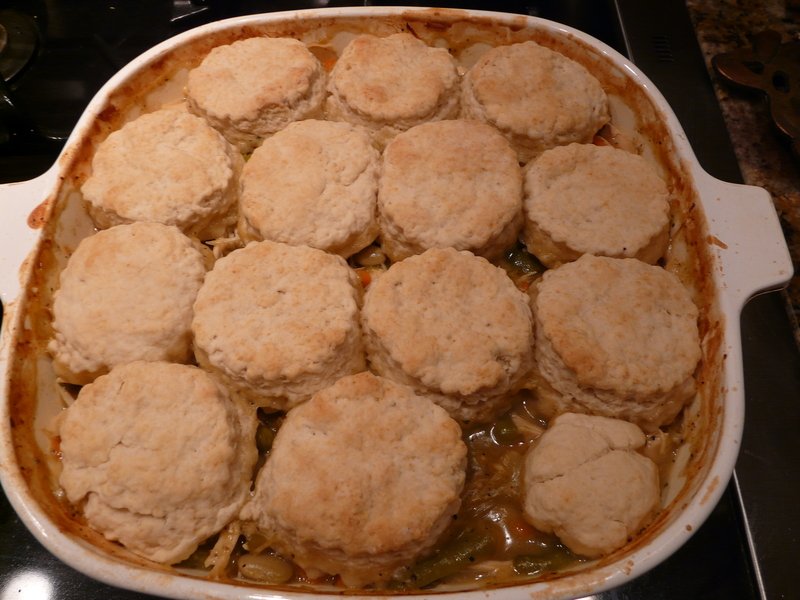 If it’s too thin, the biscuits will sink too much and be down right yucky. My oven is set at 400 for about 20 minutes. The biscuits should be nicely tanned on top. Sweetums likes a little butter on the biscuits. What a lovely picture. And we have enough left over for tonight. How can you love a man who doesn’t like leftovers, especially when they are this good? You know, this is not what I planned to write at all. This entry was posted on December 5, 2013 at 7:26 pm and is filed under Knitting. You can follow any responses to this entry through the RSS 2.0 feed. Both comments and pings are currently closed.